Google has announced version 1.3 update to Android Wear that brings support for interactive watch faces and adds a new feature called Translate that will let users speak to their watch and let it translate it on the fly to any of 44 available languages. The new update is rolling out to Android Wear watches around the world as we speak. The main highlight of this update is interactive watch faces that is mainly centered around bringing information that is more important to you right on the watch face itself along with the ability to interact with those bits and pieces of information, allowing you to perform actions like launching apps or sharing info with friends. This is very similar to how Apple Watch Complications feature works. Perhaps the most useful of the lot is the ‘Bits’ watch face that lays out multiple interactive complications around the time. Tapping these complications, which include weather, battery, steps, calendar events, unread emails and more, opens a more detailed view, keeping as much information at the user’s fingertips as possible without further cluttering the interface. The ‘Under Armour’ watch face lets users tap the screen to switch between viewing step counts, calories burned or the distance that they have traveled in a similar way to how the Apple Watch’s Activity app functions, though the interface is obviously quite different. The least obviously useful watch face is called ‘Together’, which allows a user to select a friend or family member with which to pair their Android Wear devices. Once that’s done, the entire watch face acts like a live feed for sharing things like photos, emoji, current activities and more. Bundled with Android Wear, this addition, in particular, feels like a feature that doesn’t quite have a real use beyond showing what Android Wear is capable of. Similar to the Apple’s Watch’s Digital Touch, we’re dubious about just how much use Together will actually see. For a full list of watch faces that supports new APIs for interactivity, check out Google Play’s Interactive Watch Faces section here. 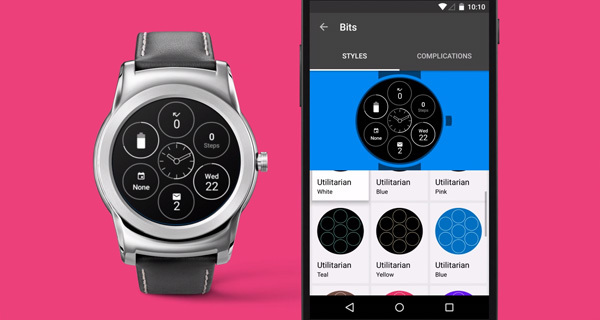 These new features are welcome addition to Android Wear and they highlight Google’s commitment to the wearable space. Expect to see this new update arrive on your wrist in the coming days. no one cares about stupid ugly iDeadBattery watch, not even iFags. Jony ive the idiot, kill yourself.